The team over at the Flying Machine Arena has been busy combining two of our favorite toys – quadrotors and Kinect. Like many other hacks, they are using Kinect to monitor their joint positions, mapping a handful of actions to the operator’s movements. 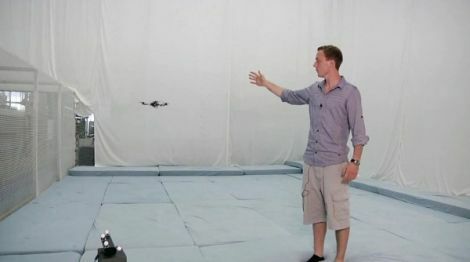 Once the quadrotor is aloft, it can be directed around the room using the operator’s right hand. The gesture recognition system responds almost instantly, guiding the vehicle in all directions with ease. When the user’s left hand is raised, the quadrotor does a mid-air flip and awaits its next command, while a quick clap of the hands brings the machine to rest on the ground. For the protection of anyone testing out the system, overhead motion tracking cameras are used to keep track of the Kinect’s position, creating an invisible midair barrier through which the quadrotor is not allowed to pass. If you have a minute, check out the video below – controlling quadrotors looks way more fun than any Kinect game we’ve come across. The hack is fun, but what’s really impressive is that quadcopter. It is astonishingly stable. I want one. I happen to agree with BobSmith I’m very impresed with the stability of te quadracopter mabey its because it dosn’t require user input at all times so there is less of the ability to conduct an error. every quadrocopter i have tried has been total crap, just basically flew into the nearest wall at top speed, anyone got any recommendations for ones i can buy in the shops that actually hover like this one? @twopartyepoxy – the litte Gaui ones are pretty amazing when it comes to off the shelf stability. the flying arena quads are pretty tightly controlled. They hardly oscillate which probably comes down to the fact that a computer is at the helm so they can run wickedly stiff PID settings on their boards. And they’re pretty well optimised for their weight. @twopartepoxy: once it flies it’s good for market, you’ve got to program the active stabilization part yourself. I love how it hovers wherever it is. Im wondering though, it is controlled in three dimentions, right? Itd be anticlimactic if it wasnt. Err, not to complain or anything, but Jon Oxer did this same thing at linux.conf.au back in Jan 2011, in his talk ‘Use the force, Linus’. Can’t seem to find video of it online though. Next video, Kinect actuated flush…. This thing has enough power to do interesting things, no? Frickn Kinect PR stunt. Just because they use a Kniect they get all that publicity. Cameras have been around for quite some time! This is just stupid. They are not using kinect here… they use 8 Vicon motion capture cameras. Brandon Martinez liked OPEN Power (Prototype 1).